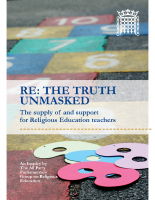 This report is the result of an inquiry carried out by the All Party Parliamentary Group on RE in 2013 to investigate the supply of and support for teachers of religious education. The report draws on over 400 sources of evidence and concludes that there are some serious issues which need to be addressed if schools are to provide high-quality religious education for every young person. 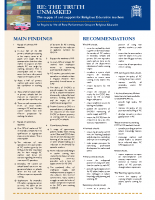 Click below to read the final report RE: The Truth Unmasked and a one-page summary.